For those looking to bypass the velvet rope surrounding fine arts, Art Everywhere US kicks off today in a fittingly popular location, New York City's Times Square. 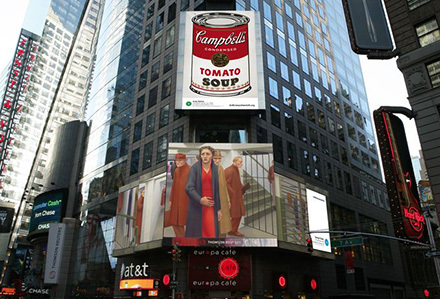 It is the world's largest outdoor art show, and it is coming to a movie theater, health club and shopping mall near you. A star-spangled rendition of the British exposition currently touring the United Kingdom, Art Everywhere is a crowd-sourced collection canvassing all American artistic movements. Through August 31, 2014, 58 pieces by American masters ranging from John Singer Sargent to Robert Mapplethorpe will be reproduced and displayed in 50,000 public locations nationwide. "It is a sizeable undertaking," says Max Anderson, Director of the Dallas Museum of Art and master of understatement. In January 2014, Anderson personally secured the participation of four other national art institutions: New York City's Whitney Museum, the Art Institute of Chicago, the Los Angeles County Museum of Art and the National Gallery of Art in Washington DC. Each of the five museums composed a list of 30 pieces that could "tell the story of American art," explains Anderson. "We had to look at rights cleared, permissions needed, and the quality of reproducible imagery. After that, we shared our lists, did a bit of horse-trading and eventually winnowed the list down to 100." 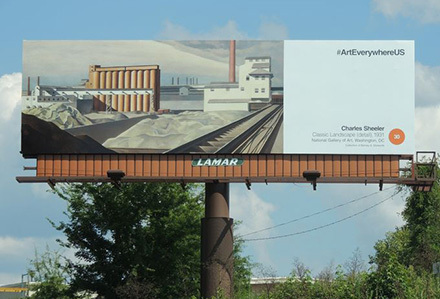 If Anderson and his contemporaries charted the course for this road trip through American art, Outdoor Advertising Association of America (OAAA) is sitting shotgun. The trade association secured the 50,000 public spaces where the works will appear, and covered all production costs for the participating institutions. Online voters determined the final list of 58 works that will be displayed in public locations in all 50 states. Edward Hopper's "Nighthawks" received the most popular votes, and Hopper is one of a handful of artists with multiple works on the list. Other crowd favorites include Winslow Homer, Jasper Johns, Willem de Koonig and Mary Cassatt. "This isn't a sober, serious march through American art," says Anderson, stressing the breadth and accessibility of the works included. He remembers teasing his colleagues at the National Gallery for their "YouTube-worthy" nomination of an unnamed folk artist's cat painting. "Everyone loves cats, I suppose," Anderson laughs. There are some surprises in the collection. Anderson was startled that American voters chose to include the "prosperity" quilt by dark horse nominee Frannie B. Shaw. A handful of influential artists are notably absent from the final list, such as 20th Century innovators Jackson Pollock and Jean-Michel Basquiat. 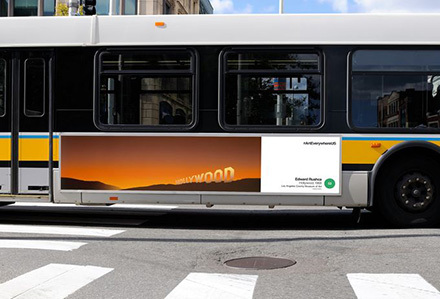 Those that did make the cut include Roy Lichtenstein's "Look Mickey," which will be on digital displays at Washington, Philadelphia and Los Angeles Sports Clubs; Grant Wood's "American Gothic," which moviegoers can catch at AMC and Regal theaters nationwide; and others on billboards along 1-95, the Massachusetts Turnpike and Dan Ryan Freeway in Illinois. For a detailed guide to the pieces and their locations, check Art Everywhere's website. The organization created an interactive map to all displays nationwide – and there's not a single velvet rope among them. 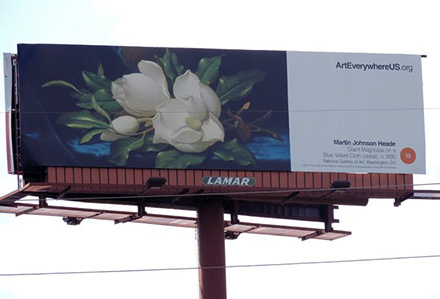 Lamar Advertising Company donated space on over 950 Bulletins, Posters, Shelters and Digital Billboards for Art Everywhere. The original article appeared on USAToday.com. Lamar Advertising Company (Nasdaq: LAMR), a leading owner and operator of outdoor advertising and logo sign displays, announced Tuesday that it has acquired the assets of Marco Outdoor Advertising, Inc., enhancing Lamar’s position in New Orleans and the surrounding market.